Oh! I thought of a project that could have been included in the previous quilled bird round up post. 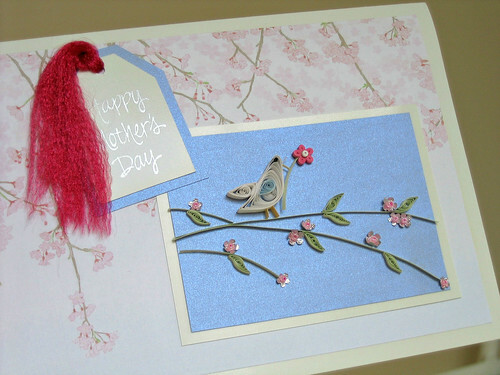 It's even timely because it's a Mother's Day card - one I made a couple of years ago, but I ended up dropping it into a box of projects that need revamping. You might think at first glance that it looks just fine, but trust me, in person it does not. The main dilemma was with the type of paper used for the card itself... I'd run out of white card stock. No problem, I thought, I'll just use a sheet of bright white photo paper. Famous last words! 1. What I didn't think about is that a piece of folded photo paper bends and sags when stood as a card. 2. Because of the slick surface, the patterned background paper didn't stick evenly - it's rippled and bubbly. 3. My clever idea to fray a piece of satin ribbon for the tag tie? Not so clever - it's flyaway and fuzzy. 4. And to add insult to injury - in the time the card has been stashed away, the photo paper yellowed unevenly - a lot. Not good. These two photos were taken at the same time, just at different angles. The quilling is glued onto light blue metallic paper - ooh, just like a sunny day, I thought when I chose it. Yet when the camera looked at it straight on, it's gloomy gray instead. There's a metaphor in there somewhere. Never mind... I'm sure you'll have better luck with your card! The background paper is from the fab site, Canon Creative Park - it's free cherry blossom stationery that you can print out (there is even a matching envelope). Narrow (1/16 inch) quilling paper gives a delicate look, but standard 1/8 inch would be fine too. 1. 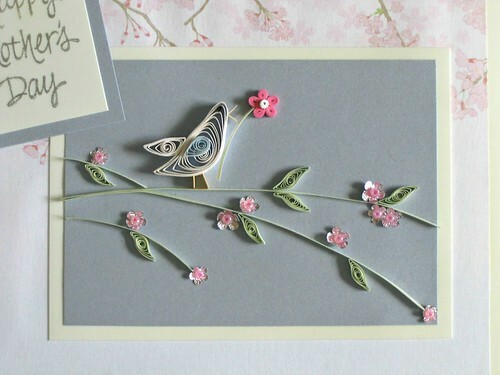 Make the punched cherry blossoms and quilled leaves - the instructions are detailed in a Mother's Day card I made for Makezine - here's that tutorial. 2. Make the bird - roll a 20-inch white, shaped coil to which you'll add two wings - the pale blue teardrop wing is 5 inches and the white triangular one is 10 inches. 3. Add a teeny 1/2-inch black tight coil for the eye, a yellow beak and legs, and green stems. For the beak, legs, and stems, cut strips from card stock or glue two quilling strips together for extra strength since they will stand on edge. 4. Lastly, make a five petal flower using a 3-inch pink strip for each tight coil oval petal and add a 2-inch white tight coil center. If you've never quilled before, you'll find all the instructions you'll need to get started in these quilling tutorials. Recommended quilling and paper craft supplies can be found in my Amazon shop. No matter what you say on all the "flaws", it is a beautiful card. Aw thanks Gail, one of these days I'll take it apart and remount the quilling. We are our own worst critics Ann! It truly is amazing how we all see the fluid lines and cheerful colors. The gray simply plays a supporting role and try as I might, I can't see the uneven yellowing. Thanks Cecelia. Believe me, the pics are very forgiving. Your work always look good and I love how you encourage beginners to try out your designs which helped me a lot when I started out. That's so nice of you to say, Suganthi. Thank you! Ann, thank you so much for sharing this! It's beautiful. I learned paper quilling, even though I don't remember it being called this, more than 30 years ago. I was not inspired to take it to the next level then, but have recently become very interested in learning. Artists such as yourself, who enthusiastically teach others are worth their talent in gold! I appreciate it very much. I'm so glad you found your way here. Thanks for letting me know you enjoy my posts. It's comments like yours that make blogging worthwhile. Happy quilling!